Youth Art Month is an annual observance each March to emphasize the value of art education for all children and to encourage support for quality school art programs. Youth Art Month provides a forum for acknowledging skills that are fostered through experience in the visual arts that are not possible in other subjects offered in the curriculum. To direct attention to the value of art education which develops divergent and critical thinking; multicultural awareness; and technical, communication, and expressive skills. To recognize art is a necessity for the full development of better quality life for all people. To increase community understanding and interest in art and art education through involvement in art exhibits, workshops, and other creative venues. 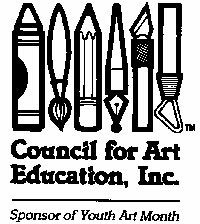 To reflect and demonstrate the goals of the National Art Education Association that work toward the improvement of art education at all levels.